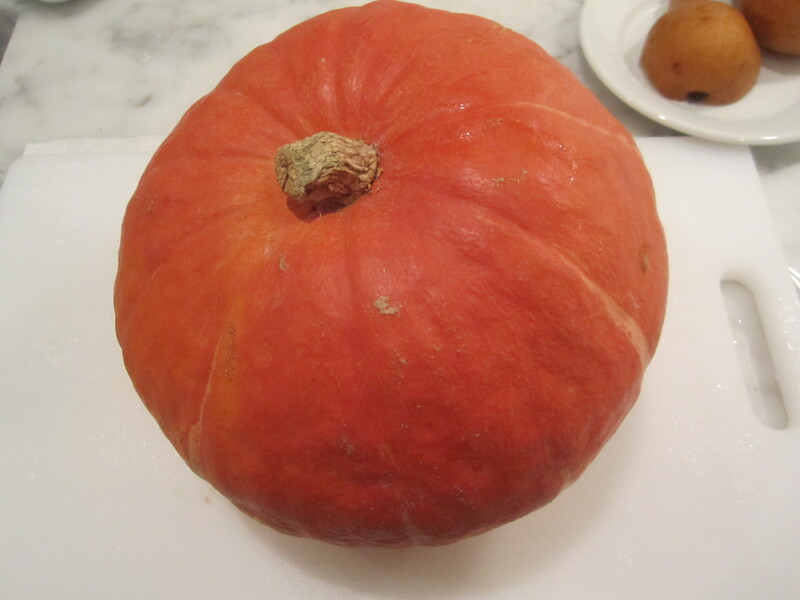 In Italy, they refer to all manner of winter squash and pumpkins generically as “zucca“. It’s difficult to pin down which variety they’re referring to when they name it in a recipe. Usually, I use butternut squash, but today, I decided on kabocha, a variety of winter squash that is round, ribbed, and has either dark green or orange skin. 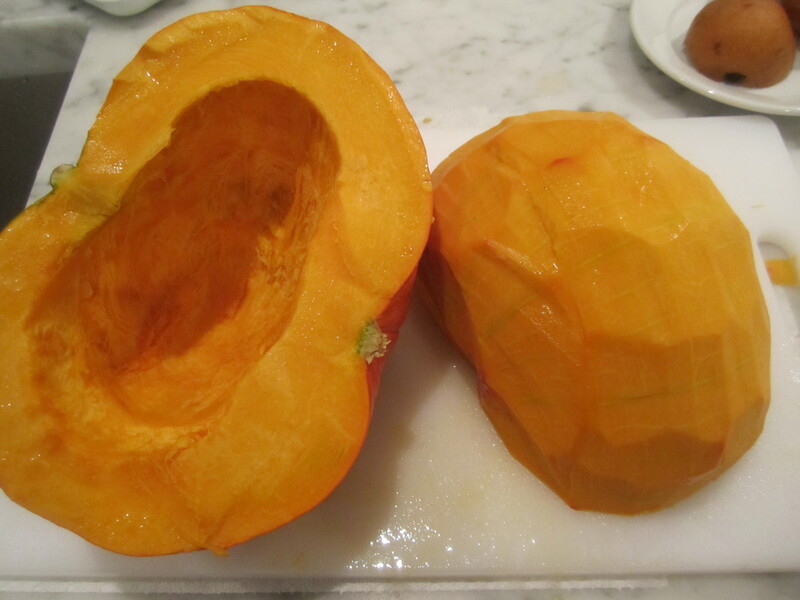 The orange variety is also known as “sunshine squash”. It’s even sweeter and more delicate than butternut (believe it or not). Initially, I set out to buy a conventional pumpkin, to make in the style of my mother’s hometown–with oregano and bay leaves. You’ve seen this combination in one of my fish posts–pesce in umido. 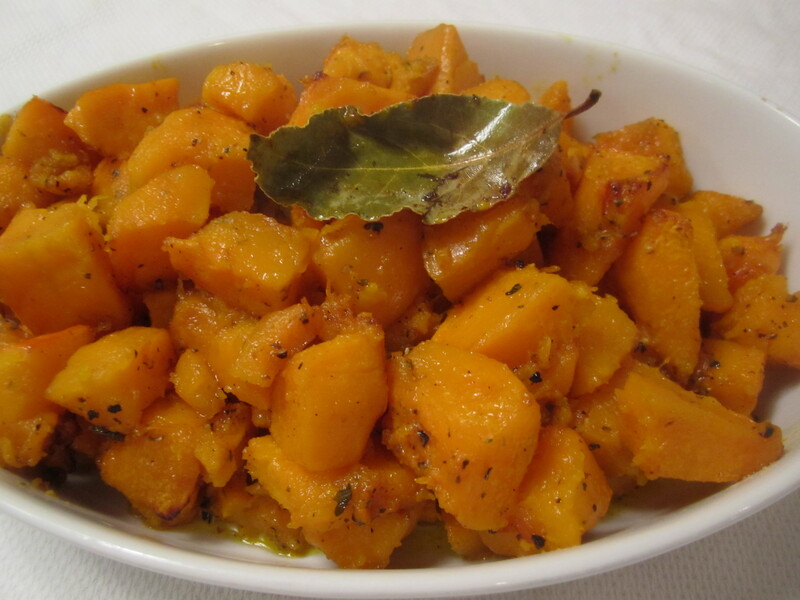 It’s an equally alluring and exotic combination with winter squash. The traditional way to make this dish is to peel and slice the pumpkin, and saute it in a skillet. 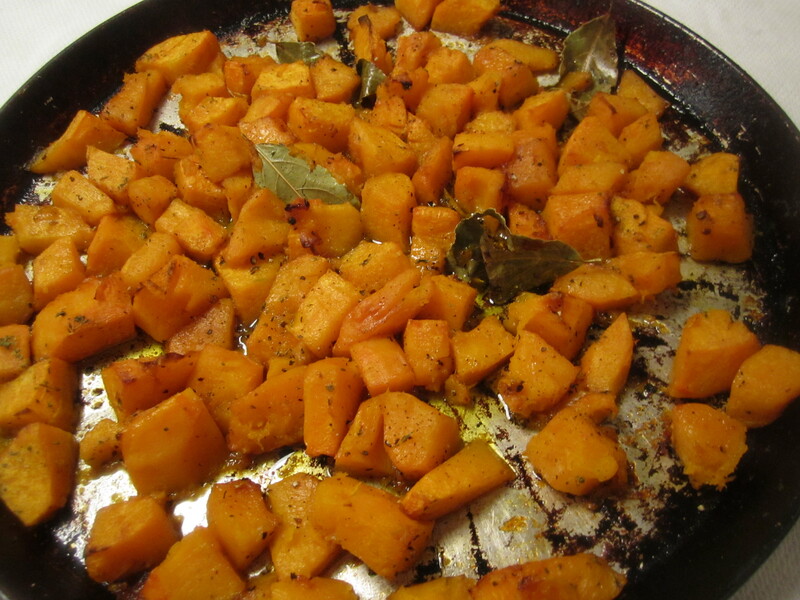 I chose, instead, to roast it in the oven, which resulted in soft, sweet cubes of squash, scented with the herbs, that required almost no attention. I would recommend it highly. 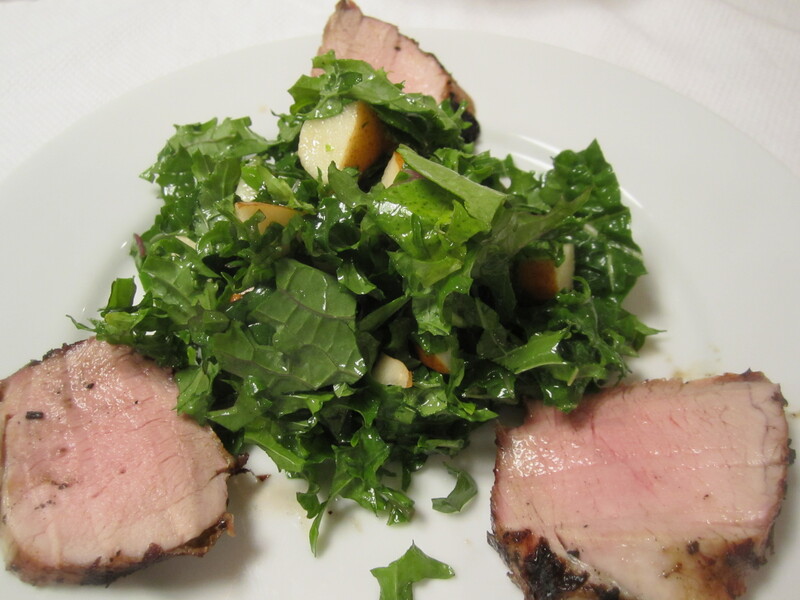 Along with the squash, we had dry-rubbed pork tenderloin and a salad of just-picked russian kale with sweet, local ripe bosc pears, dressed with red wine vinegar, agave and a touch of olive oil–the perfect fall meal. 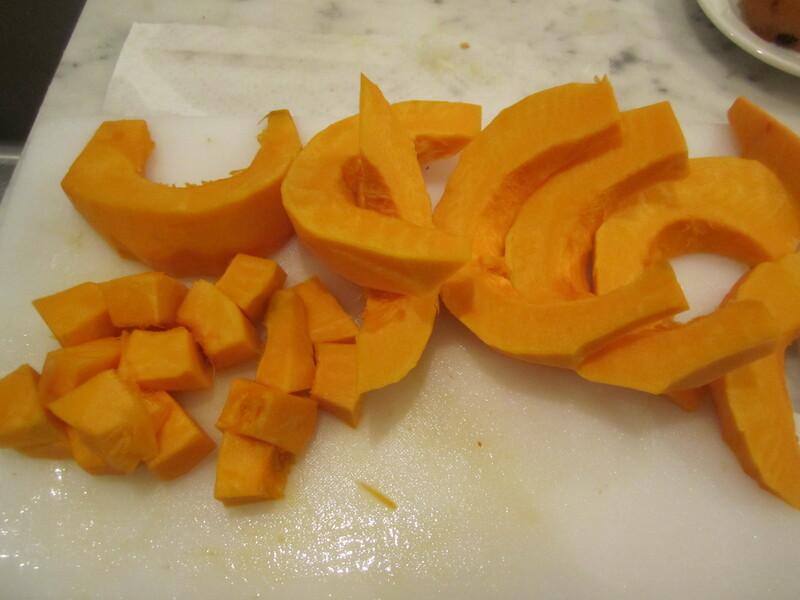 To peel squash, cut off top and bottom to make a steady flat surface on which to slice off the peel. Run a large knife (it’s tough) underneath the peel, attempting to remove as little meat as possible under the peel–it takes a very firm grip on the knife. With a spoon, scoop out seeds and discard or set aside (they make a wonderful snack roasted on their own, but not tonight–no time). Cut into wedges and then into 1″ chunks. Place on roasting pan with remaining ingredients. 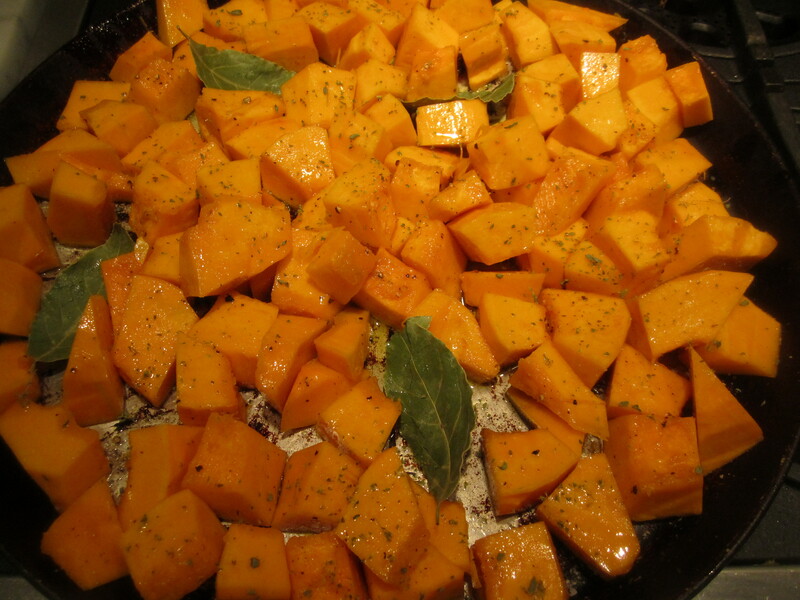 Try to tuck in the bay leaves so that they are underneath the squash cubes, flavoring the oil as the dish roasts. Roast for about an hour, or until tender. Turn and toss midway in the roasting process to evenly cook. Taste for salt and pepper prior to serving.